The Royal Pharmaceutical Society (RPS) has used data from C+D readers to illustrate to NHS England’s Keith Ridge that stress is a growing problem among pharmacists. A briefing document – compiled by C+D from the past five years of Salary Survey data – revealed that stress levels among UK pharmacists rose six percentage points between 2016 and 2018. C+D’s document – which you can download here – was presented by RPS English board chair Sandra Gidley to NHS England’s chief pharmaceutical officer Dr Ridge in a meeting on January 10. The document also highlights the impact of stress on the public in 2018, with 34% of the 1,067 pharmacists who responded to last year’s survey saying it had the greatest effect on their service to patients. Stress-related problems affecting readers in 2018 included: trouble sleeping, cited by 43% of pharmacists; depression (27%); drinking more than usual (11%); and suicidal thoughts (6%). Ms Gidley stressed that NHS England has been “broadly supportive” of this agenda and the RPS “will be working with them to try and further this”. In the meantime, the RPS is “deciding its next steps”, Ms Gidley added, “including the possibility of a roundtable meeting with other relevant pharmacy organisations from all sectors to try and progress this”. Editor James Waldron said C+D is “proud that the time so many readers dedicate to completing the Salary Survey each year can be put to such positive use”. “The first-hand accounts of readers struggling under the weight of unsustainable workload pressures – and the impact on their physical and mental health – is deeply concerning. C+D’s stress data was compiled by deputy editor Lilian Anekwe. Read her view on why the findings prove this issue must be tackled head on, as well as C+D’s in-depth analysis of the data. The C+D Salary Survey 2018 – which ran throughout October – was completed by a total of 1,916 pharmacists and pharmacy staff. C+D's full coverage from the survey can be found here. 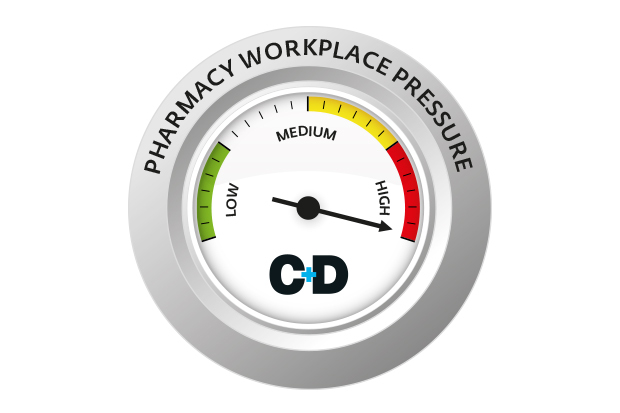 How do you think C+D should address growing stress in pharmacies? LETS FACE FACTS. Dr Ridge thinks community pharmacists are glorified shop-keepers & that we should really be based in surgeries with patients making an appointment to see us. He just doesn't get it ...that our availability & position in the high street/community makes us a unique NHS resource...readily available , approachable and very cost effective. Dr Ridge is just the governments hachet-man ...austerity with a green cross symbol. I've never personally met the man but Dr Ridge clearly does not give a damn about the precarious plight of community pharmacy. I am amazed he's still in his job after his unethical use of an obscure Scandinavian study as justification for the drastic DH community funding cuts. I started out in community pharmacy many years ago, I worked hard to achieve a career in what I thought would be a stable and fulfilling role. Years later, this profession has destroyed my marriage and my life. It has affected my mental health and my own wellbeing. I loved my job and the colleagues I worked with, but, after the company I worked for sold to a large multiple, my life was never the same. This might sound dramatic to some, but it is a fact that they destroyed everything I had. The workload was intolerable and the stress unbearable for me. I was always very capable and hard working, and coped fine with the pressure of a busy pharmacy, but the stress and pressure from this large multiple was unbearable. I have now had to leave the company and a good salary (due to being a TUPE colleague) and I’m now trying to put my life back together, with the help of my family and friends. I’ve chosen to go back to an independent community pharmacy, and due to the current climate I have had to take a substantial drop in salary, but at the end of the day I have had no choice in a order to look after myself and my own well-being. I would never recommend this ‘career’ to anyone, I am now faced with the prospect of losing my home and everything I’ve ever worked for, and I only hope that something is done before it wrecks anyone else’s marriage and future. I'm truly sorry and feel for you. Have you considered changing sector to GP practice instead? Much happier and much less pressure. Community on the other hand will just get worse and worse every day. The best way to let go of misery and sorrow from community is to get out of it! Dear HP I'm deeply saddened to hear of your experience and I wonder if James could find a way of asking readers to give us some anonymous insight as to how their lives have been affected over the years - perhaps to highlight not just the terrible experiences you have had but from others who might have found a "rainbow" or a different brighter future? Anyway I do hope that you have turned a corner. I would like to think that smaller pharmacy chains or "family businesses" are more nurturing and able to help pharmacy staff when they need this. Hi Honest Pharmacist. Firstly, I am sorry to read of your challenging career journey and how it's adversely affected your personal life. I am glad you have found an independent pharmacy in which to rebuild your livelihood. Please also be aware of the resources offered by Pharmacist Support, Listening Friends and the RPS etc. Best regards in your recovery journey. I doubt if the info provided to Ridge will warrant a tup'ny damn from him. There is stress out there,and you can see it on the faces of the general public too. Try Sahaja Yoga free meditation,read the books,go to local meetings,watch the Sahaja Yoga documentary "The Vision",which takes 33 minutes. Medically there is evidence for Sahaja Yoga,and you can read the book "Silence Your Mind" by Dr Ramesh Manocha,GP and researcher at the university of Sydney.This book is in many public libraries,and the general public can and does read it too. "God spoke to you by so many voices but you would not hear" by James Joyce has helped me in what we call the painful birth of collective consciousness in Sahaja Yoga,which the psychiatrist Carl Jung also described. I hope you will try this and engage constructively.Pharmacy and pharmacists are pillars of the community and it is time to lead the way,and Shree Mataji and Sahaja Yoga can help us. Shree Mataji was awarded a United Nations Peace medal in 1989,and Claes Nobel thanked Her for giving hope to humanity in a special ceremony at the Royal Albert Hall. No, pharmacists and their staff are pillars of the community. Pharmacy includes those who take from the community, often protecting the ill-gotten gains in offshore structures. Well said, ultimately a Pharmacy is just a building. What makes it a healthcare panacea is the skilled and dedicated individuals within it. Pharmacy teams are always at the brunt of abuse, unrealistic expectations, and excessive workloads. Each aspect feeds into the other. Just recently I had some scream at me wanting me to replace a medicine they had damaged without a prescription, with a bit of hate speech thrown in. I don't think anyone should be expected to receive an experience like that, however many of us have done. There is more that must be done to protect pharmacy workers health, both physically, mentally and emotionally. Most places now have policies in place with a zero-tolerance to such behaviour. My question is - does anybody who has been on the recieving end know of any customer banned over it? I can attest to that. I have been on the receiving end after going out of my way to deliver a new blood pressure medication to a patient who had been harassing my staff all day about the prescription that had yet to arrive. Upon delivery, I received a ton of abuse and a significant threat of violence. The customer had to be banned, but I had to threaten to seek an injunction order to compel my employer to do it. I'm a little personally charged when I hear of workplace harassment because of it, I think understandably. I don't anyone else to ever feel unsafe like I did. I used to work for a large multiple and it nearly ruined my marraige due to the stress myself and the team were under due to ridiculous targets, untrained mangers and zero support... Something needs to change soon! I'm sure I'm not alone when I say that Dr Ridge's actions and the damage they have caused over the last few years are the main cause of the stress I feel as a pharmacist and contractor.